May 25, 2018 at 9:39 pm. 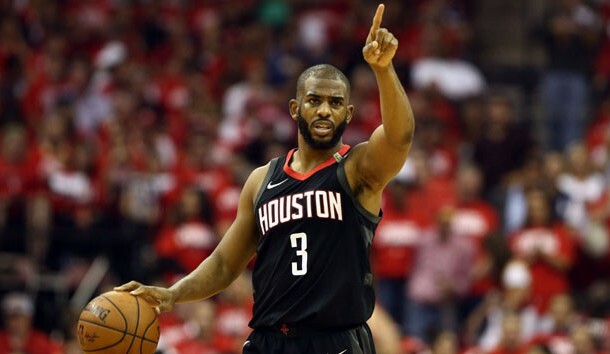 OAKLAND, Calif. — The Houston Rockets will attempt to close out the defending champion Golden State Warriors in Game 6 of the Western Conference finals on Saturday night, but will have to go about it without star point guard Chris Paul. Paul had 20 points, Eric Gordon 24 and James Harden 19 when the Rockets moved to within one win of their first trip to the NBA Finals since 1995 with a 98-94 home victory over the Warriors on Thursday. As it turned out, the key play of the game — in more ways than one — occurred when Paul suffered a strained right hamstring while attempting a missed floater in the key with 51.7 seconds remaining and the Rockets clinging to a 95-94 lead. Paul was unable to return to the defensive end after the miss, giving the Warriors a five-on-four power play with a chance to go ahead. But instead of placing their uncovered man, little used Quinn Cook, close to the basket, the Warriors spotted him up for a 3-pointer, which he missed after nervously fumbling a pass. The Rockets went on to score the final three points on free throws to go ahead 3-2 in a playoff series for the first time since 2009. Paul is seeking to reach the NBA Finals for the first time in his career. Now it’s possible the Rockets will make it, but he won’t. The club wouldn’t speculate about his availability past anything more than Game 6. He will be re-evaluated when the Rockets return home Sunday, either for a Game 7 against the Warriors on Monday or for Game 1 of the NBA Finals on Thursday. The Rockets went 15-9 without Paul in the starting lineup during the regular season, with Gordon replacing him on 21 of the 24 occasions. Gordon has been a key contributor to the Rockets’ success off the bench in the series. He has single-handedly outscored Golden State’s reserves 38-16 in the last two games, both of which Houston has won to reverse what had been a 2-1 deficit in the series. Of course, the Warriors have had health issues of their own in the series, with Andre Iguodala having missed Games 4 and 5 with a bruised left knee. With or without Iguodala, history says the Warriors will be tough to beat under the circumstances they’ll be experiencing in Game 6. Since Kerr took over as coach in 2015, the Warriors are 36-6 at home in the postseason, including an NBA-record 16-game winning streak that was snapped in their 95-92 loss in Game 4. They’ve won 26 of their last 32 playoff games regardless of the site, and have a 3-1 record under Kerr in potential elimination games, with the lone loss coming in Game 6 of the 2016 Finals against Cleveland. The Rockets, meanwhile, have wasted no time disposing of vulnerable opponents this postseason, eliminating Minnesota in the first round and Utah in the Western semifinals at first crack after going up 3-1 in each series.